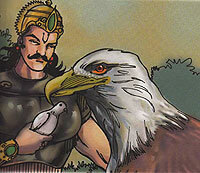 Shibi Rana was a great king. He was famous for his truthfulness, justice and keeping his word. One day the gods decided to test him. Once, the king saw an eagle chasing a dove. The dove was frantically looking for a place to hide and came and settled in the king's lap. The dove said "Oh king, please save my life." The king had take a vow to protect anyone who took his shelter. Shibi Rana hid the dove in his lap. When the eagle saw this, he said, "Oh king, you have hidden my prey. Please leave the dove and let me satisfy my hunger." The king wanted to protect the dove but at the same time, he did not want to deprive the eagle of his prey. He offered to give the eagle the same amount of meat in return. The eagle demanded flesh from the king's right thigh on the condition that not a tear should fall from his eye while his thigh is cut. The king thought that cutting away a little flesh from his body would not kill him and the dove would also be saved at the same time, so he agreed. The dove was placed on one side of a balance and the king's flesh was added, the dove was always heavier. A small tear appeared in the king's left eye. When the eagle confronted him, the king explained that the left thigh. At this, the eagle and the dove vanished. Shibi Rana had passed the test and the gods blessed him.